I love Jamie Oliver’s Italian Minestrone recipe from his Venice Food Escapes show, but have historically I’ve always hated Minestrone soup. Maybe I’ve just had bad Minestrone as a kid? You know, the commercialized canned Campbell’s soup variety with an acidic tomato paste taste. I wasn’t even willing to give this soup another chance, until I got hooked on watching Jamie Oliver’s Food Escapes. This is one of my favorite cooking series of all time. Jamie travels around Europe, cooking amazing food, in the midst of amazing cultures. In Venice, he went to a women’s prison where the prisoners grow their own produce in a prison garden. He proceeded to raid their veggie garden so he could cook this soup for the inmates. It was inspiring seeing the fresh garden veggies go from garden to pot to plate, you forgot they were in a prison. There are a only few things that aren’t readily available in my fridge or garden that Jamie uses in his recipe. Zucchini flowers, radicchio, a boney end of a prosciutto, and home made pesto. I love home made pesto, but be careful not to overpower the soup, and don’t use store bought pesto, for your sake. Every great soup starts with a great stock. Use a homemade stock, easy to make in advance and can even freeze it until you are ready to use it. Italian Minestrone recipe is a flexible soup, in that you can use whatever vegetables you have in season in your garden, or at your local market. There isn’t really a right or wrong vegetable. At the end of the day, this Italian Minestrone Soup is just a vegetable soup with rice or pasta. Simple and delicious. Bon Appetit! Приятного аппетита! Heat oil in a large stockpot on high. Add the onions carrots and garlic. Cook and stir for about 5 minutes. Add the bacon and celery and cook for 5 minutes. The onion should start to soften and caramelize. Add the beans, zucchini, tomatoes, peas and parsley and beetroot stems and cook for about 5 minutes. Pour the soup stock in the pot and add the orzo pasta. Bring to a boil, then simmer for 10 minutes. Add the beetroot leaves and basil and stir. Ladle into bowls and sprinkle with grated parmesan and garnish with fresh basil and home made pesto. * instead of bacon I used the ham pieces from my stock recipe. Feel free to add the meat of your choice, the bacon adds depth and slight smokiness to the minestrone. 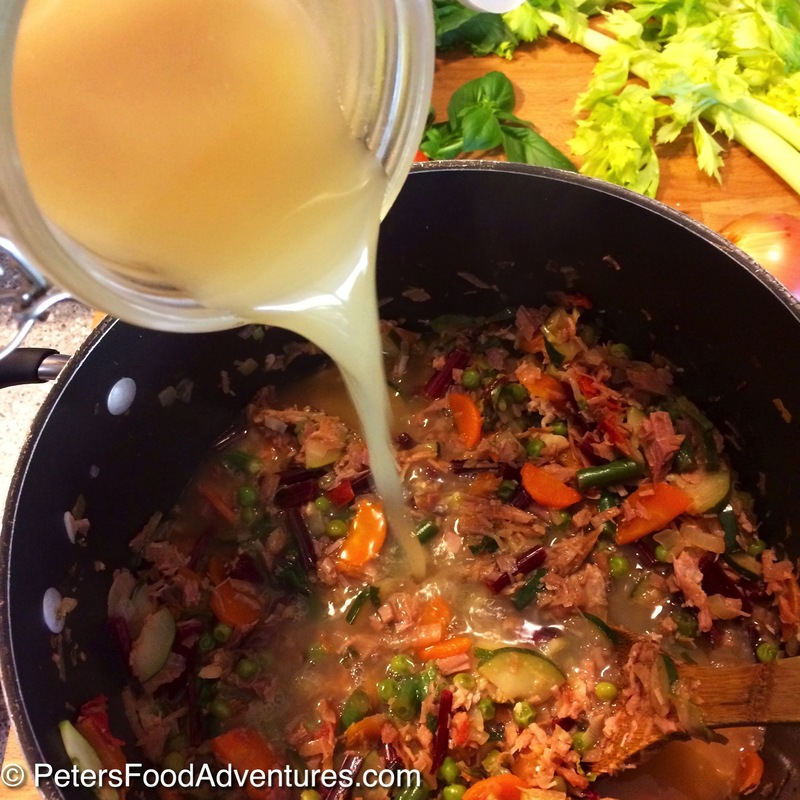 This recipe works with beef and chicken stock as well.